Old Harry Rocks lies directly east of Studland, about 1.5 miles northeast of Swanage, and about 3 miles south of the large towns of Poole and Bournemouth. The chalk headlands of the Ballard Downs are owned by the National Trust. 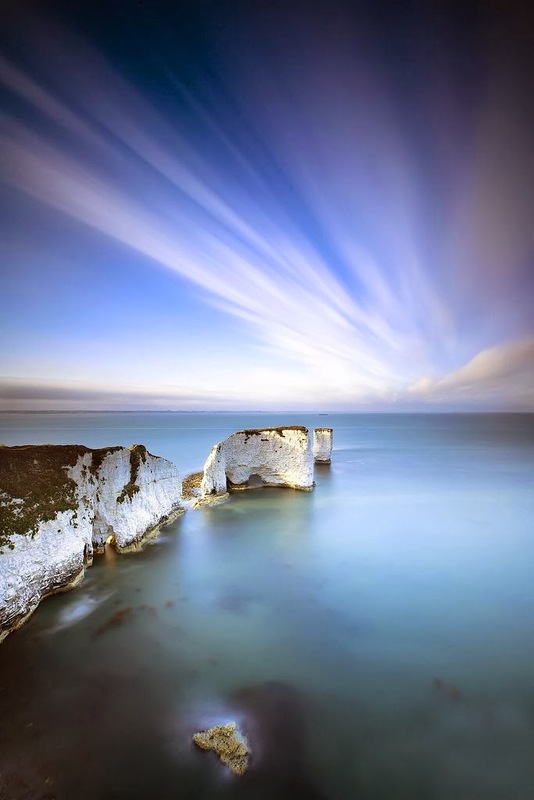 The rocks can be viewed from the Dorset section of the South West Coast Path. The chalk of Old Harry Rocks used to be part of a long stretch of chalk between Purbeck and the Isle of Wight, but remained as a headland after large parts of this seam were eroded away. As the headland suffered Hydraulic action (a process in which air and water is forced into small cracks by the force of the sea, resulting in enlarging cracks), first caves, then arches, formed. The tops of the arches collapsed after being weakened by rainfall and wind, leaving disconnected stacks. One of these stacks is known as Old Harry. Old Harry's Wife was another stack which was eroded through corrosion and abrasion, until the bottom was so weak the top fell away, leaving a stump. Hydraulic action is the main cause of erosion in this case.